Our anti slip flooring solutions use a two part solvent free polyurethrane resin that results in extremely hard wearing, heavy duty finish ideal for factory floors, anti skid applications, steps, footpaths & gangways. Ideal for car tranporter ramps our anti slip solutions give a high friction & durable surface that will improve grip immensely. Health and Safety legislation demands that modern workplaces be safe for employees, and an anti slip floor installed by Northern Maintenance will help prevent skids and slips protecting your workforce. 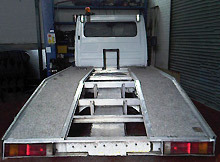 An example of one of our non slip applications; this vehicle transporter has been coated with a hardwearing anti skid coating.